Have you noticed that often, what galvanizes you into doing something isn’t necessarily logic or rationale, but rather a feeling, be it of urgency, fear, excitement, showing off and other emotion? Take weight l oss, for instance. Sure, healthcare professionals will tell you to lose weight because being obese can cause heart disease, diabetes, high blood pressure and joint pain. But the reasons that will get most people off their butts will be things like looking good, getting into that dress, showing off at that high school reunion your hated rival will be at, or getting girls. We often buy on emotion, not logic. And that “buy” refers not just to goods, but ideas. Scenes from movies are especially good at arousing emotion. They inspire and motivate us, and that’s what this series is about. In part 1 I’ll share three ideas that inspired me to try something from a movie or video. Hopefully, clicking the links and watching will get you interested in moving too! Dancing is great exercise, training balance, flexibility, coordination, strength and endurance, among other things. But most people will give up before they even try, believing they have ‘two left feet’, and afraid they’ll be embarrassed. But that might not be so! How would you know if you don’t try? There are so many different styles of dance. Have a look at some Youtube vids or attend some dance performances to find something that interests and inspires you. Two cool dance styles right now are streetdancing and salsa. Unless you’ve been living under a rock, you would be pretty familiar with the Step Up and StreetDance franchises. These movies feature inspiring and creative dance, and take the word “Cool” to a whole new level. Gone is the stigma of being an escape of the Ah Bengs and Ah Lians of old. Along with mainstream exposure from culturally ambiguous shows like “Britain’s Got Talent” and “So You Think You Can Dance”, street dancers are getting a respect and admiration long overdue. Most importantly, they are inspiring people to get off their butts into action, and that’s important to stay healthy and young. Here is the final dance scene from Step Up 2. Observe the variety of styles, and you’ll realize that not all of it requires you to be super flexible and super fit. You can always pick something that suits your abilities, and remember, most schools start out with beginner classes. We all start somewhere. For those whose idea of real dance is ballet, check out this final scene from Streetdance 3D to see how a creative mind can blend the best of different styles to still create something wonderful and moving. Purists, however, need not click the play button. First to dismiss the notion of latin dances being sissy or not macho (a common hangup of guys), here is a salsa battle from the movie Street Dance 2 to prove how manly or aggro you can take it . Ignore the extremely complex stuff and don’t be intimidated by the tricks and lifts; you will not do this unless you’re interested in performance or competition. But that won’t be all of us. It certainly isn’t me. Salsa is something you can learn to a mid-level capability and still have lots of enjoyment. It’s really a great feeling to be able to move your body purposefully, to be able to dance with a complete stranger and communicate just with the subtleness of your lead and the quality of your frame. Plus you get to meet lots of people, widening your social circle, and making friends you might never ever meet staying in the office from 8-6, then going straight home. Watch these two club dancers dancing for an idea of the standard most people will be able to reach in a year or two, if not sooner. I’ll bet that looking at these scenes will cause many people to say “Toss that, I’m gonna look this cool too!” and get moving, either to classes or to the mirror to try something. As you progress you’ll improve your coordination, agility, balance and movement, making you feel a lot younger! Here are some links you might use as a starting point for your research. We’ve seen young kids speeding, jumping, grinding and doing the stairs on inline skates. While it looks cool, it’s probably not something us over-35s would be eager to try, given the risk of broken bones and slower healing than the young ‘uns! However, as with everything in this series, there are lots you can still learn that will bring you enormous satisfaction. For example, even the basic skill of rolling, stopping and turning is enough to give you a few decent skates, a good workout and a feeling of freedom and exhilaration. Skating has a floaty feel to it, and is a unique experience if all you’ve ever done is walk on solid ground. And many people quickly progress to more difficult skills, finding it a great way to get to work or explore Singapore! If you don’t start, you’ll never know how far you could go. I saw some of these videos and just fell in love with the idea of starting to skate. Remember roller skates, with that four wheels rectangle formation and a brake stop in front? Looked clunky, and some people didn’t think it looked ‘cool’. This clip with the great Gene Kelly not just skating but dancing in roller skates will change your mind! Airborne was one of the oldest movies that promoted inline skating, or ‘rollerblading’ as it was once called. Here’s a scene that inspired me with the sense of freedom and flow being able to skate might bring. Could you dance on modern inline skates too? Look at these two genuinely happy people doing just that! Look at this guy freestyling it. The freedom and fluidity of movement. He’s almost floating and walking on air. The biggest fear most people have is falling, or being unable to stop and rolling on forever and ever. We are so used to having terra firma beneath our feet that the idea of rolling, falling, doing the splits is high indeed. But with proper instruction, anyone should be able to start, stop, and turn. You will learn how to fall safely. It will be a new experience, like learning how to walk, and wouldn’t this be as close to being a baby you’ll ever get again? That’s as young as you’ll ever get! There are a number of skate schools. I haven’t tried any of them but this list will give you a starting point. Climbing seems insurmountable to a lot of people. It looks like you need lots of strength but hey… you can’t even do a pull up. It also looks dangerous… it’s so high! Well guess what, it’s actually neither. 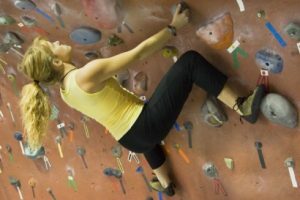 Climbing requires technique, which means saving energy from wasted muscle exertions. Indeed, it’s a common observation that women tend to do a lot better because they have to rely on technique, while men try to ape it with brute strength and get stranded when all that lactic acid kicks in. Here’s a movie starring Tom Cruise in… you know what! We won’t be doing anything remotely near this! Anything you start will be at the beginner’s level, and there are classes for that! In my opinion, it’s really safe if you have a competent instructor, all the safety checks are done and you have a competent belayer. I have a deathly fear of heights so I can tell you that it’s a huge challenge, but I still felt safe because the way it was taught gave me confidence to forge ahead. Ladies don’t have to worry about upper body strength, because with the correct technique you’ll be using it won’t be a concern. In fact I have found that ladies do a LOT better because they have less upper body strength, and have to rely on real technique. Guys tend to want to muscle their way up and tire real quickly! Here’s a video that explains the basic concepts and you’ll see you really can start at an easy level. Here are the people I learnt from. To end, remember that anything that looks cool probably looks cool because it’s not easy. But remember also that everyone starts somewhere, and there was a time, long ago, when we could not walk, but had to crawl, stand, fall, and repeat the whole process. If cool is your thing, and being a cool alive after 35 person is your reason to start some exercise, then go for it! Anything that gets you moving is a bonus in my book!